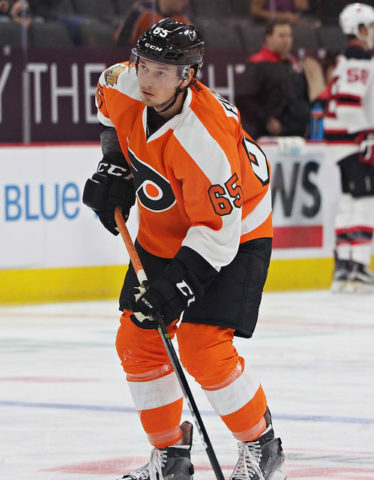 After a good junior career in the WHL with the Calgary Hitmen, Russian center Radel Fazleev played his first pro season in the AHL, playing for the Philadelphia Flyers’ farm team, the Lehigh Valley Phantoms. In this translated interview, originally appearing on the Russian-language website business-gazeta.ru, Fazleev talked about his first year in the AHL, problems with his coaches, and adaptation to pro hockey. 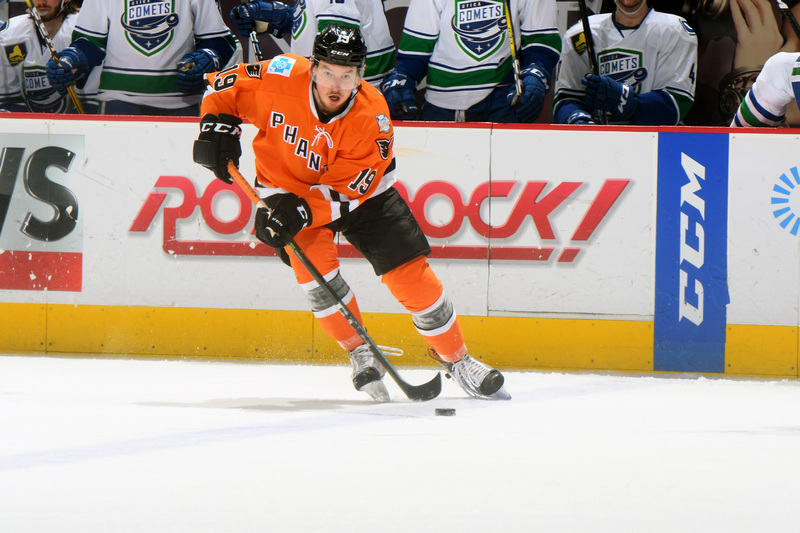 Dzhaudat Abdullin: Radel, during the playoffs you didn’t play for Lehigh Valley. Were you injured? Radel Fazleev: No, everything is okay with my health. It has been a rocky season for me on the psychological plan. I couldn’t find a common language with the coaches. Why? Let’s start with the fact that the team couldn’t find itself in the postseason for seven years. Therefore the team signed a lot of players during the offseason and the roster changed a lot. I got to know the guys last season when I was called up, although I couldn’t play because of a hand injury. So I got to the training camp without knowing many of the guys. The team had enough money to sign some stars. So, it was clear from the start that they would be playing on the top two lines. We had three good centers so, frankly speaking, I could only expect to play on the fourth line. I don’t have anything against it, but the game is a bit different there. It has been excellently explained by my coach: I needed to play hard, trying to get under the opposition’s skin with my energy. The most important thing was not to allow any goal, and scoring myself would have been a bonus, it wasn’t required. I certainly understand that every team needs such players, but those aren’t my strong points. Let’s start with one consideration: I’m not that fast, therefore I have to try and do something unusual. But this isn’t welcome on the fourth line. I tried to play the way the coach wanted, but it didn’t work. I tried playing as I wanted, and I showed some flashes, but then if there was a mistake, then I would be benched. I was simply punished for not playing the way the coach wanted. If that’s not enough, I constantly played until the New Year, but then the coaches decided to give more trust to the most experienced players. I remember that once one of our players was never benched for the full two minutes we played three on five. DA: In spite of all this, the official website of the team congratulated all the fans: “Thank you for the fantastic season”. RF: I can’t argue against that, I was just trying to explain things according to my point of view. The season was fantastic, the team for the first time in seven years managed to reach the playoffs. But talking about me, going on with the season I started playing less and less, as the coaches preferred another center who is five or six years older than me. DA: Was it bad for you? RF: Yes, and it was even noticed by one of the team’s staffers, the one who is responsible for the players’ development. He told me that he couldn’t recognize me, that I usually am on the positive side, but that I couldn’t even smile. He told me that I needed to get in a better mood because doing that way wasn’t useful for me, nor for the team. I would say that I gathered much experience. I understood a lot of things. I could watch the NHL live. I was under the impression that no one is doing a single mistake there [in the NHL]. Someone doesn’t like dumping the puck in the offensive zone, but that’s not a way to lose the puck because even if the defensemen recover it, the forwards start forechecking. It’s much better than losing the puck on the blue line and allowing a counter-attack. Everything makes its own sense. I understand the coach, but I, as a player, need more freedom, and less schematization. The coach gave a certain degree of freedom, but only to the more experienced players, the ones who could allow themselves to make a mistake. We, the younger players, must play in the simplest possible way. However, our older players explained to us that everyone had to pass through that. The only thing to do is not to make excuses and keep on working. I know I’m the only one to blame. No coach would make decisions against his team’s needs. DA: Aren’t you worried that the next season will be like this one? RF: It will not! I gathered a lot of useful experience, and that will help me now, not when I’ll be 25 or 26 and they’d just bench me. DA: What’s most important for the Phantoms: to get to the playoffs or to develop players for the Flyers? RF: This is an interesting question. 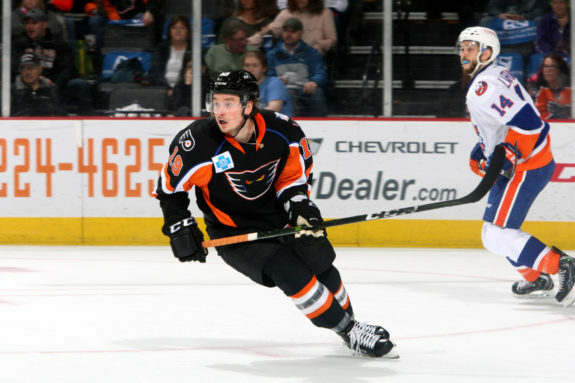 When the team wasn’t good, Flyers prospect(s) would come here and play a lot, and also develop a lot. But this year I think that the Flyers prospect(s) had less space. DA: Including your coetaneous Travis Sanheim? RF: No, he played a lot. Sanheim was a first-round pick, therefore he had a lot of freedom. At first, he was making some mistakes, but then he really fulfilled his full potential. I was a sixth-round pick, and there’s a big difference here. And at some point, all the three Flyers prospects, including me, were left out of the lineup. And there I started [asking] myself that same question: what’s important for the team, winning or developing players? I couldn’t find a reply, but we also thought that it would have been better for us to play side-to-side with experienced players, rather than playing in the juniors. Before getting to Lehigh Valley I couldn’t even imagine that there were so many things I didn’t know about hockey. There are so many details that make the difference. I understood that being with all these experienced players I have a lot to learn. And this is just the AHL. If I got to Pittsburgh, for example, then I would have to compete against Crosby and Malkin, my head would start spinning in circles and maybe at this point I would already have stopped playing. DA: Do you remember what the president of your former KHL team, Ak Bars Kazan, told us during an interview? He said that he was sure that Fazleev would come back as he understood that he made a big mistake in signing a three-year deal right after the draft. RF: Of course I read that interview. I don’t want to start an argument with such a well-respected man like Shamil Khusnutdinov: he has his view, I have mine. The fact is that I didn’t sign right after the draft, but one year later. Ak Bars Kazan didn’t offer me any contract. I was 19 at those times, and I really wanted to stop being financially dependent on my parents. I take as example my father, who is my example in general in my whole life. At age 19 he already had a family. It was terrible for me at the same age to ask my parents for money, especially in a bad period like that, when he was just fired from the Ak Bars academy. At the same time, the Flyers offered me a contract. It was a good offer, with a good signing bonus; how could I reasonably refuse? Of course, I do understand all that Ak Bars made for me, it’s the best hockey school in Russia, but the truth is that we can truly understand if I made any mistake just in a few years. DA: Your cousin Ruslan Fazleev is considered one of the top 2003-born players in Russia. Is he really good or at his age the physical side is more important? RF: I think he’s taller than me. I haven’t seen him for a long time, but I hear very good things about him. It can’t just be anthroponomy, you must have a good head too. From my father I heard that he skates very well and [makes] very good decisions. I can’t wait for him to become a little bit older and to be able to start playing for the national team. DA: Do you feel differences between Canada, where you spent three years, and the USA, where you played last season? RF: There’s a huge difference. Maybe you don’t feel like that at first, but after a bit you start discovering a lot of things. People are truly different from Calgary to Allentown. There’s a lot of people from Mexico in the USA. There are so many that they talk themselves in Spanish, rather than in English. DA: In Calgary, you lived with a billet family. What about in the AHL? RF: In Allentown, young players would rent a place, two or three of them, for example. I was living in a place with four players. At first, I had some everyday problems, but thankfully I met some good people. Petr Straka helped me a lot. At first, we got in touch because he didn’t have anyone to share a place with, then he was traded to another team, so I needed to start doing things alone. DA: All of your previous seasons had something to be remembered for: medals on the international stage, debut in Canada, and so on. What about this season? RF: This year I played with pros for the first time, and hockey really started being my profession, and I had a different level of responsibility. This year was good for me as I got acquainted with a new league, a new level. Unfortunately, I didn’t play for any national team. This summer I will again skate at the development camp, and I’ll stay there to prepare for the new season. It will be hard to practice from June to September, but you need to [make] some sacrifices to improve your level. I understand that it would be wrong to relax at home and “practice” there. DA: Did you manage to follow the Flyers and Ak Bars during the season? RF: I did follow the Flyers at first, when I was with Straka. Then he went away, my mom and my girlfriend came to visit me, I was very busy and I only had time to browse the NHL app and read the reports. Regarding Ak Bars, I only followed the results, and I’m glad that the team had a good season.